You know that feeling, when you just think to yourself, “Gee, I really wish I could give beer to my impossibly small, wildly underage children”? Polite society can be so restrictive. Blah blah blah brain development. Blah blah blah alcoholism rates and early experimentation contributing greatly to an increase. Blah blah blah bladdy blah. Well, happy day! Problem. Solved. My kids love this bread. And, yes, they’re well aware that the alcohol bakes off entirely. We’ve got the subject of drug and alcohol consumption wide open in my house. Along with every other taboo subject. Including how babies are made, the dangers of cigarette smoke and what happens when you die. Wow did we ever jump into the deep end or what? Let’s get back to the shallow end of the pool. Which is filled with Better Batter gluten-free flour, egg whites, butter, apple cider vinegar, just a touch of light brown sugar and your favorite gluten-free beer. Hey, what is your favorite gluten-free beer? I’ve had a sampling (Redbridge, Bard’s, Estrella), but far from all of them. Estrella seems to be the most authentic. And it makes a really nice beer bread. And since I’d generally rather eat than drink, that matters to me. Oh, and I added finely chopped fresh oregano. It really complements the brown sugar and beer. A word about measuring 6 ounces of beer (which is all the recipe calls for). 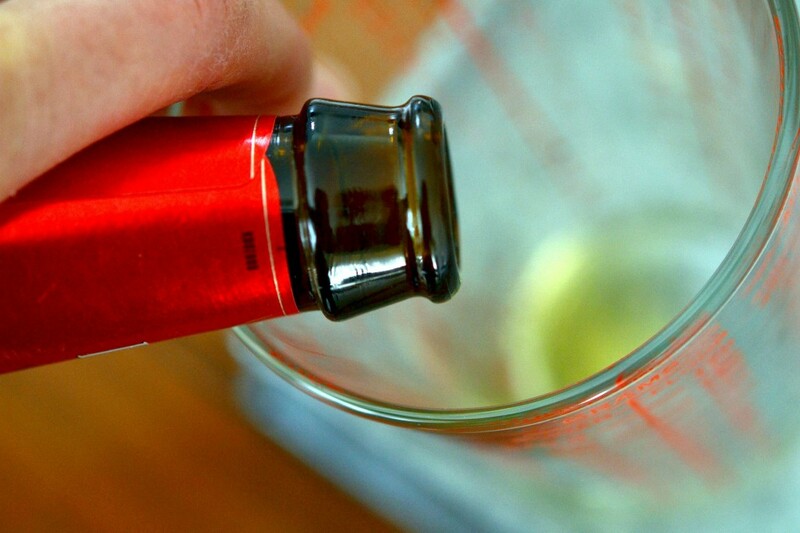 To get an accurate volume measurement, use a glass measuring cup if you have one, and pour the beer slowly down the side of the glass while tilting it to avoid most of the foam. It’s impossible to measure the actual volume when there’s a tall head of foam. 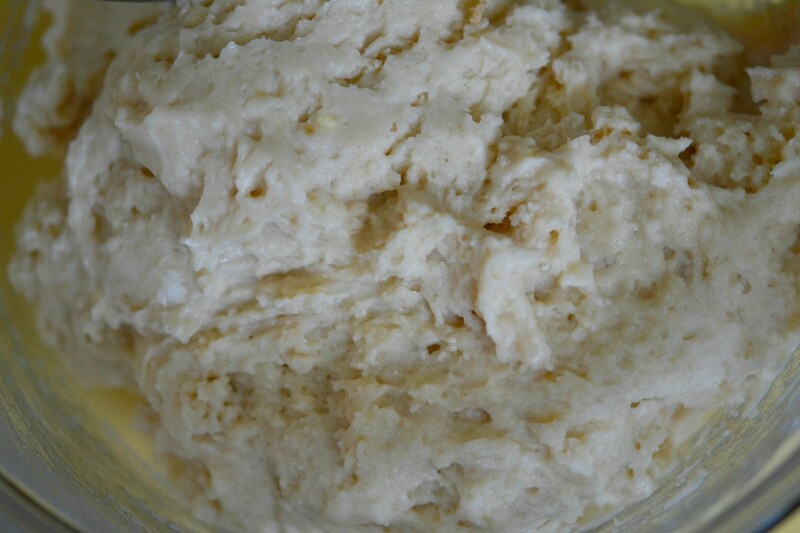 The dough is soft and shaggy. Not dense at all. 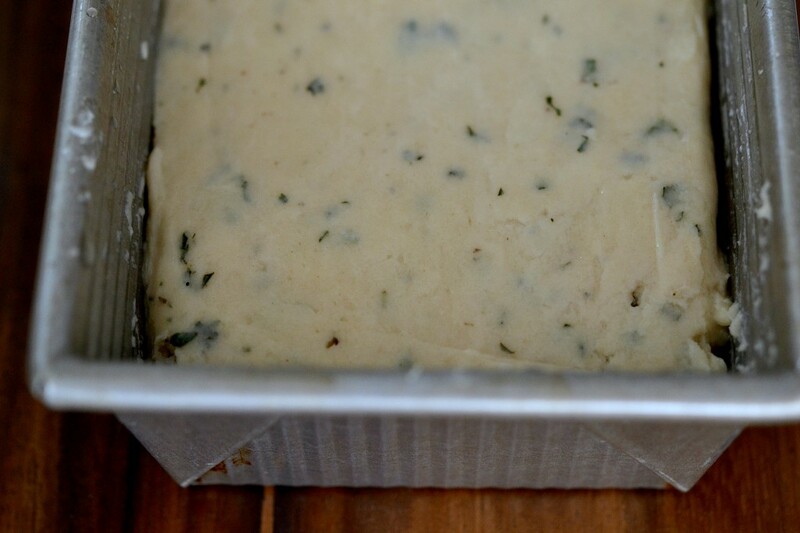 Add the chopped herbs, and scrape the dough into a greased loaf pan. Smooth the top with very wet fingers and a wet spatula. Tent the pan loosely with foil, and bake for 25 minutes. Then cut a shallow slice in the top, rub some unsalted butter on the top, rotate the pan, and finish baking. Around that 25 minute mark, the bread will begin to smell so rich and buttery, you’ll be in danger of losing your mind. Be sure to let it finish baking, and to cool completely before slicing it. Preheat your oven to 375 degrees F. Grease well a nonstick loaf pan that is no more than 9 inches by 5 inches, and set it aside. In a large bowl, place the flour, xanthan gum, cream of tartar, salt, whey powder, baking powder, baking soda and brown sugar. Whisk to combine well. Add the cider vinegar, egg whites, butter and the beer, and mix to combine. The dough will be shaggy and soft. 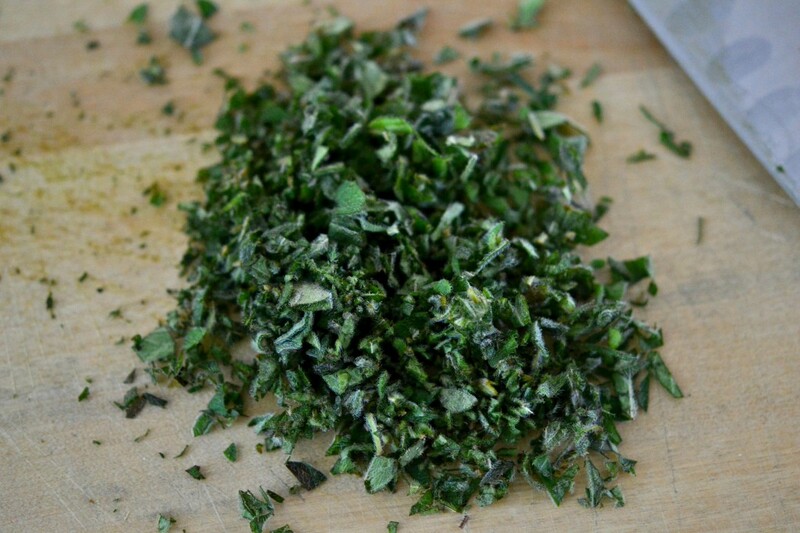 Add the minced oregano, and mix to distribute the oregano evenly throughout the dough. Scrape the dough into the prepared loaf pan. With very wet fingers or a wet spatula, spread the dough evenly in the pan and smooth the top (see photo). Tent the loaf pan with a piece of aluminum foil, making sure you leave room for the bread to rise without touching the foil. Place the tented loaf pan in the center of the preheated oven and bake for 25 minutes. Slide the pan out of the oven, rotate the pan 180 degrees, and remove the foil. With a very sharp knife, make a shallow slice down the center of the bread lengthwise (without reaching either end). Rub the extra tablespoon of butter all over the top of the bread (it should melt completely into the hot bread). Return the uncovered bread to the oven and bake until the top is golden brown and a toothpick inserted into the center of the bread comes out clean (about another 20 minutes). Remove the pan from the oven and allow the bread to cool in the loaf pan for at least 15 minutes. 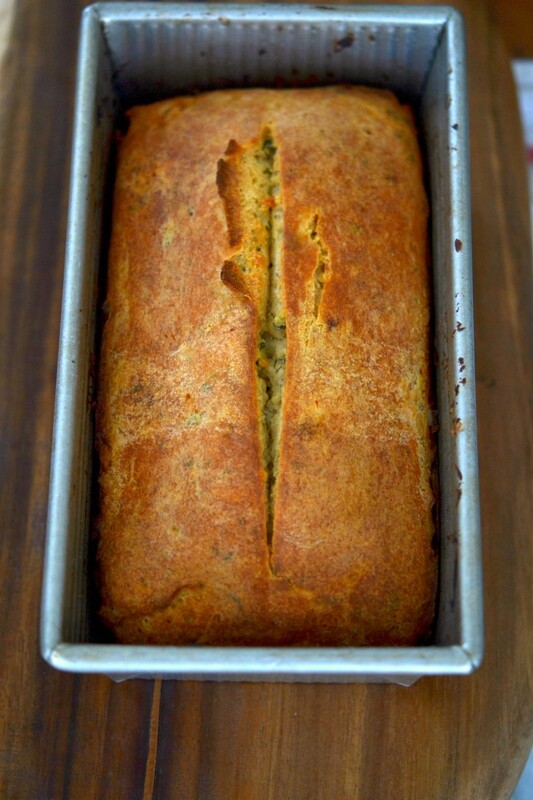 Transfer the loaf pan to a wire rack to cool completely before slicing and serving. I have used various gluten-free beers in this recipe. This time, I used Estrella. I have also used Redbridge and Bard’s. So far, Estrella is the one I like best in beer bread. 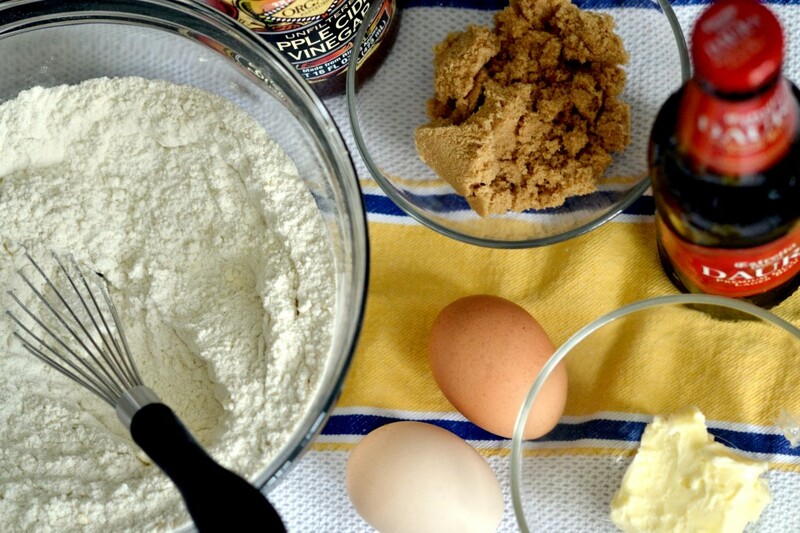 Baking with beer is like cooking with wine. Don’t cook with a wine you wouldn’t drink (the flavor doesn’t dissipate – it concentrates), and don’t bake with a beer you wouldn’t drink (same reason). Just bought some Estrella today…can’t wait to make this. I was nervous when I bought it because it isn’t labled GF but the clerk brought me documentation telling WHY it isn’t labled as such even though it is. My Whole Foods didn’t have Niblack whey powder so I bought Bluebonnet instead…it’s still labled GF. 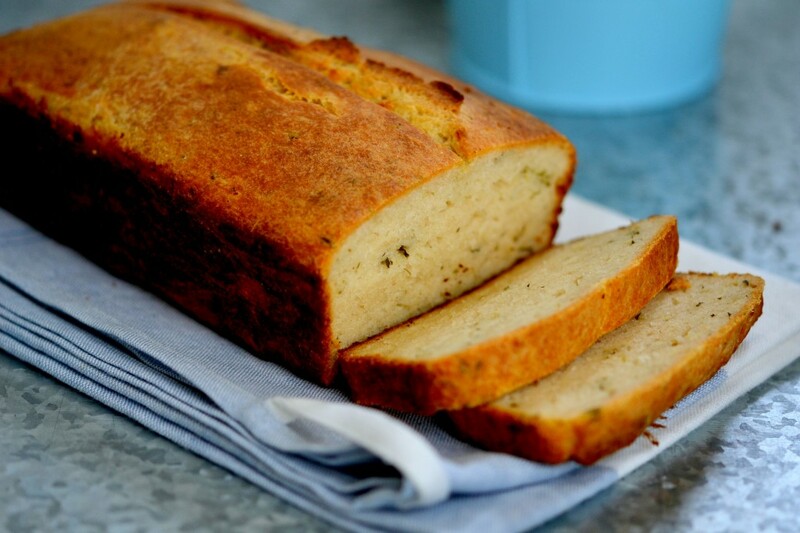 Does this bread work out well without the herbs? My kids aren’t big on “things” in their bread…lol. Thanks. Thanks! I decided to put them in anyway and to my surprise my pickiest of kids LOVED it!!!!! I’m sure the herbs would need tweaking, but do you think that a good hard cider could work in this, rather than beer? I have yet to find a GF beer that comes close to good old Guinness (and yes, I know, acquired taste) but I find cider different enough and a pleasant alternative. That sounds really interesting, actually. You might want to eliminate the herbs altogether the first time around. Or try adding some cinnamon. Sounds good! Any way to make it without the whey powder for those of us allergic to whey? This looks incredible! Making!! Thanks for posting. I’m so flattered that you are here. If I had known you were coming, I’d have baked a cake! Throwing another shout out for New Planet beer; keep an eye out, it’s going national and would make a killer beer bread. That said, if I were to make up a mix of the dry ingredients and just add the wet when necessary, how long might that mix last? If I could have quick beer bread I’d be a happy camper. 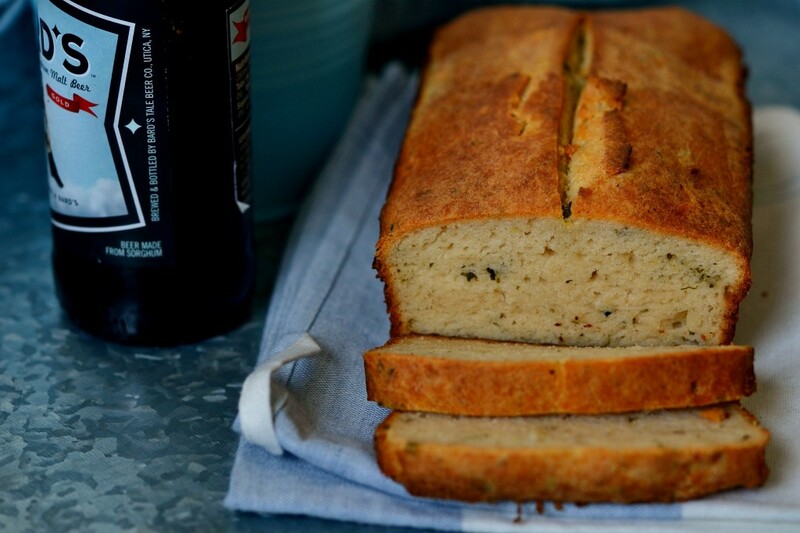 I miss my pre-GF days of nearly instant beer bread. I’m really excited for New Planet beer, then! Yes – you could definitely put together the dry ingredients, all the way up through the brown sugar, and store it in an airtight container until you’re ready to use it. Good idea! I know this is minimal – but for those with alcohol problems, it might be good to note that alcohol does not entirely disappear when you cook it. Good point, Theresa. Thanks for the information – and the link. I am so excited about this!My husband and I are newly (about 3 months now!) gluten free and are really trying to find fun things to bake and yummy replacements for things we miss. I can’t wait to try this! My husband is eager to try more GF beer, so it’s a win-win! I am also loving your cup-for-cup comparison feature! Thanks so much for it all. We love your blog! Nic, I love yeast free bread…can I tell ya…yeast freaks me out. Gonna try this over the weekend…btw…since we are somewhat local, where do you get Estrella? I have to double check with my husband, but I believe he has bought Estrella at the DeCicco’s CTown in Scarsdale. I believe they also have it in their Brewster store. I will check, though, and edit this comment if I’m wrong! Cool, I’ll check Scarsdale or maybe I’ll call them. I would love to go to the event in April, send me some info. I would love to not be freaked out!! Here is a link to the Spring class schedule at Rainbeau Ridge. The bread baking class is on Thursday, April 26 from 9:30 am to 11:30 am. I’ll be honest with you, I didn’t realize they had opened registration, or that the summaries were up, until I just looked! We had Estrella on our honeymoon in Asheville, NC where there is a totally gluten free restaurant called Posana. The food was/is incredible. However, we can’t find Estrella anywhere – we live in MS, so that probably has a lot to do with it – it’s not a state known for uh, good food. Can you order Estrella online? Where do you get yours? Oh, please do share! Love the blog, as well. I made GF pita for dinner the other night, and my 1/4 Greek husband was super impressed. A gluten-free restaurant with incredible food sounds heavenly. I honestly don’t know if you can order Estrella online. That’s a good question. Maybe someone else knows? It’s actually not super easy to get where I live either, in NY. There is one local market that prides itself on its selection of gluten-free beers, and they usually carry it (but not all the time). It is also possible to order it indirectly through a gluten-free restaurant near me. They don’t have a cash and carry license, so they order it and send it over to a local beer distributor, and it can be bought from there. If you find a restaurant that offers it near you, maybe they can do the same? Thanks for letting me know about the pita. I’m honored that your 1/4 Greek husband approved! I think I just want to move next to you and help eat the leftovers. This looks amazing. Believe me, Fatcat, I could use the mouths to feed! I think my current neighbors are tired of all my ‘sharing.’ Little do they know, there’s one more Devil’s Food Cake being made. And if it turns out well, it gets shared! Again with the shaggy? I laughed out loud…your editor would cringe…. cannot wait to make this…used a Red Bridge in my pulled pork the other day, so still have a few (Scott won’t miss ’em…he’s out of town). When the cat’s away…..the mice do make beer bread! I’m going to try the bread…and the rest of the beer, too! Zoo-ee mama, that looks awesome! 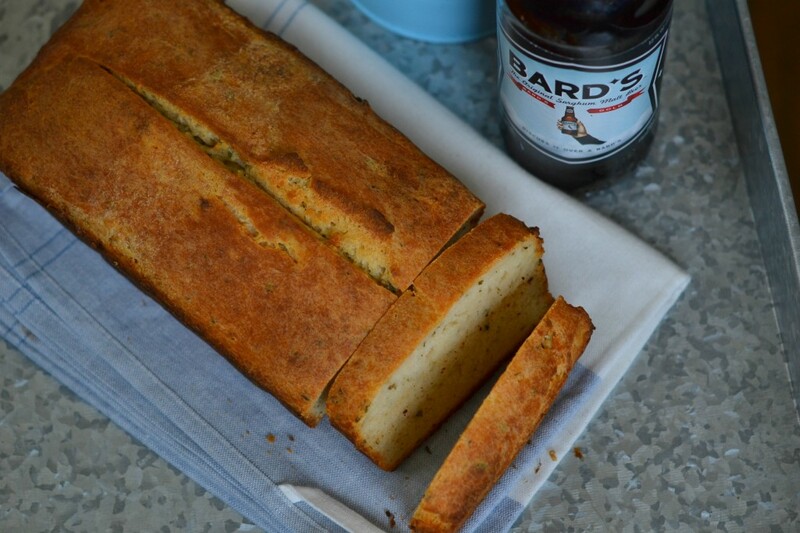 I used to make beer bread (with cheddar) in my pre-GF days. As for the alcohol, when my son was a baby, in sheer desperation we once rubbed bourbon on his sore, teething gums. And he liked it and wanted more (which we did not give him)! He’s a big ol’ 12 year old now, tall as me, won’t even try a sip of my wine or anything, has a 3.6 GPA. I don’t know, maybe we killed off those 4 brain cells that might have brought it to a 4, but I think we’re okay. :-) Haha! My favorite beer is Estrellla Damm (para celiacos), también! El mejor!